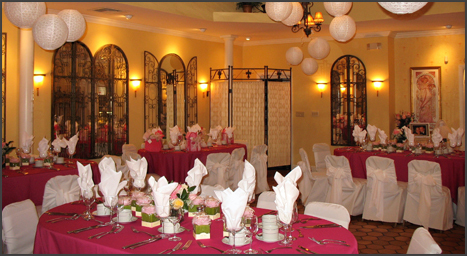 Our Private Party Room in Pleasantville is ideal for bridal and baby showers, birthday and anniversary celebrations, rehearsal dinners, intimate wedding receptions, Mitzvahs, corporate luncheons/dinners, and holiday parties. Our beautiful room features an elegant French Provence decor. The interior design incorporates Mediterranean style mirrors, French doors, high ceiling with sky lights, soft sconce lighting, and classic European tapestry. The perfect space for any occasion, this private room accommodates up to 80 guests depending on the type of event and style of service. We customize menus to accommodate our clients' diverse tastes and budget.